There are always lots of one-person shows to choose from at Fringe. 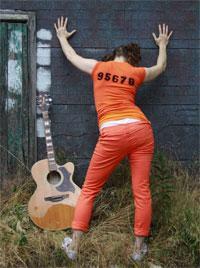 Annabelle’s Tales from Jail is a one person show written and performed by Morgonn Ewen who wrote the songs as well. Annabelle is a white southern trailer trash chick who is serving eight years for the attempted murder of The Biter, a man who has dumped her three times making him the third of her 13 exes. She’s still obsessed with him and dreams of taking care of him for the rest of his life when she gets out of jail. Annabelle is a woman who doesn’t learn. She doesn’t ever hear no without turning it into yes – at least when there’s a man involved. The music has a country feel. Most of the songs start off happy and end up sad, angry, or unfinished. Ewen does a terrific job of maintaining a southern accent, even when she’s singing. She also kept the show going while trying to tune her uncooperative guitar. She’s a fine actress. Annabelle has decided that she’s going to be her best self possible, a state that interprets as always bubbly, never take no for an answer, don’t look at anything you don’t want to see. But every now and again her sadness, anger and vulnerability peek through. Lots of mature language and mature sexual content in the play. The audience loved it. Lots of laughter.